Should Miles Morales swing into a relationship with Gwen Stacy? 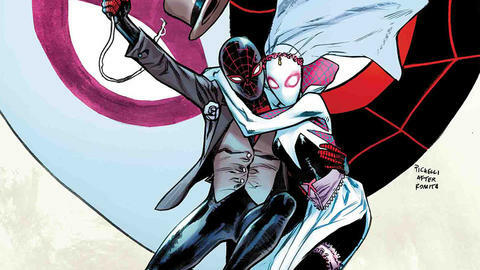 Our Spidey senses have been tingling since the reveal of Gwen Stacy and Miles Morales’ new romance—unfolding in the pages of SPIDER-GWEN and SPIDER-MAN—but before we all jump on the Giles bandwagon it’s time to take a look at this young, budding relationship and determine whether or not it should blossom or wither. What better way to do that then with a tried and true pros and cons list? -Miles and Gwen both lead the hero life and according to Morales’ best buddy Ganke, a hero needs someone who understands the pressures, responsibilities and inconveniences that come with it. -Both of our heroes remain relatively new to the web slinging life and this new shared experience they’ve fallen into could help strengthen their relationship and teach them to rely on one another for support while they learn to navigate this new chapter together, sort of like freshman year of college. -Gwen and Miles have the same beautifully pun-filled sense of humor and a team up would inevitably lead to some comedy gold. Why not foil villainous plans with a web of laughter, right? -Bringing a nice girl home might get Miles’ mom and grandmother off his back and stop them from snooping around his life accusing him of using drugs…just a thought. -And finally it would be pretty adorable for Spider-Man to find himself a nice Spider-Woman, have some Spider-Babies and maybe even get a Spider-Dog to round out their adorable little Spider-Family. -There is the slight issue of them living in different dimensions. While not the typical long distance relationship, it’s still just as, if not more, taxing on them to constantly have to pop back and forth between dimensions. -After losing both Peter Parker and Harry Osborn, and with her father in jail, Gwen might be a tad raw at present and therefore a bit emotionally unavailable. -While yes, young love can be a fickle thing, let’s not forget Miles’ obvious crush on Ms. Marvel since day one. Looks like Kamala isn’t the only flexible hero! -While it’s definitely a plus to date someone who understands the hero lifestyle, if both of them constantly gallivant around town thwarting criminal schemes, there won’t be much time left to say hello let alone go on a date. Unless you count searching for Miles’ missing father as a date. Points for being out of the ordinary? -And finally, if we look at this from a biological standpoint, this relationship ends with Spider-Gwen eating Spider-Man…that’s what most call irreconcilable differences. Now that we have our list done it’s time for the most important step in the process: tossing the list out the window and going with your gut! Will Giles make it? Find out on March 15 in SPIDER-MAN #14.